Before :- Mehinder Singh Sullar, J. For the Petitioners :- Mr. R.S. Cheema, Senior Advocate with Mr. J.S. Mehndiratta, Advocate. For the Respondents :- Mr. Satya Pal Jain, Senior Advocate with Mr. Dheeraj Jain, Advocate. (i) Accused have published the accurate statement of the Minister on the reports of PTI (Press Trust of India) as such. (ii) Fair, accurate and truthful reporting by the petitioners in the absence of mens rea would not constitute any offence. 1998(2) RCR (Cri) 455 : 2007(4) RCR (Criminal) 6, relied. (iii) Protection under Article 19(1)(a) of the Constitution of India is available. (iv) The accurate publication by the petitioner-accused squarely falls within the domain/ambit of Explanation 4 and pointed Exceptions of Section 499 IPC. Aroon Purie v. State of Haryana, 2007(4) R.C.R. (Criminal) 6. Ashok Chaturvedi v. Shitul H. Chanchani, 1998(3) R.C.R. (Criminal) 801 : 1998(7) SCC 698. Central Bureau of Investigation v. Ravi Shankar Srivastava, 2006(3) Apex Criminal 65 : (2006) 7 SCC 188. Dhariwal Tobaco Products Limited v. State of Maharashtra, 2009(1) R.C.R. (Criminal) 677 : 2009(2) SCC 370. Indian Express Newspapers (Bombay) Private Ltd. v. Union of India, AIR 1986 Supreme Court 515(1). Jawahar Lal Darda v. Manohar Rao Ganpat Rao Kapsikar, 1998(2) R.C.R. (Criminal) 455 : (1998) 4 Supreme Court Cases 112. Jeffrey J. Diermeier v. State of West Bengal, 2010(3) R.C.R. (Criminal) 183 : 2010(3) Recent Apex Judgments (R.A.J.) 437 : (2010) 6 Supreme Court Cases 243. K.M. Mathew v. K.A. Abraham, 2002(4) R.C.R. (Criminal) 288 : AIR 2002 Supreme Court 2989. M.A. Rumugam v. Kittu alias Krishnamoorthy, (2009) 1 Supreme Court Cases 101. M/s Pepsi Foods Limited v. Special Judicial Magistrate, 1997(4) R.C.R. (Criminal) 761 : (1998) 5 Supreme Court Cases 749. Secretary, Ministry of Information and Broadcasting, Govt. of India and others v. Cricket Association of Bengal, AIR 1995 Supreme Court 1236. Smt. Chand Dhawan v. Jawahar Lal, 1992(3) R.C.R. (Criminal) 534 : JT 1992(3) S.C. 618. Som Mittal v. Government of Karnataka, 2008(2) R.C.R. (Criminal) 92. State of H.P. v. Pirthi Chand, 1996(2) R.C.R. (Criminal) 759 : (1996) 2 Supreme Court Cases 37. State of Haryana v. Ch. Bhajan Lal, 1991(1) R.C.R. (Criminal) 383 : AIR 1992 Supreme Court 604. Vir Sanghvi v. State of Haryana, 2006(1) R.C.R. (Criminal) 115. Vivek Goenka v. Col. Ram Singh(P&H), 2006(2) R.C.R. (Criminal) 700. "The Human Resource Development Minister, Arjun Singh, today asked the Prime Minister, Manmohan Singh, to cleanse the administration of people owing allegiance to the RSS, an organization he accused of being responsible for the killing of Father of the Nation Mahatma Gandhi. Our first duty is that the fascist forces of the RSS should be detected. Today, Government administration is in grip of the RSS, we have to cleanse it," he said at the National Convention on Secularism here. The veteran Congress leader, who removed academicians close to the BJP and the RSS from panels drafting textbooks for schools, said the RSS had a strong hold on administration as "men having sympathies with the Sangh Parivar were appointed (by the previous Government) on key positions. If an institution's biggest achievement was killing of (Mahatma)Gandhi than you can expect what national purpose it can serve," he said called for "exposing the RSS-men in the Government. Not one but there are hundred different fronts of the RSS. They are getting crores of rupees from within and outside the country. The previous Government allowed foreign money to come in but now this web has to be broken. People should know for what purpose the money was used for." Mr. Singh said. The Minister hoped that "the Prime Minister will take definitive action in this regard." The CPI general secretary, A.B. Bardhan, said Mr. Singh and the information and Broadcasting Minister, S. Jaipal Reddy, were facing difficulties due to presence of a large number of "RSS-men" in their Ministries. "Committees are filled with RSS-men. Raj hamara, Governor tumhara (its our government but the Governor is of RSS-BJP). How long will this last," Mr. Bardhan asked. The CPI leader charged the BJP with propagating politics of hate and said the party had changed the word Hindutva with nationalism. "Don't forget Hitler played havoc around the world in the garb of nationalism". Sachin Pilot, MP and Rajasthan, moved a resolution called for a thorough study of the working of the RSS and countering its "false propaganda and a politics of hate and teaching secularism in schools". Mr. Jaipal Reddy, who presided over the convention, said the recent Lok Sabha election was a revolution through the ballot which defeated the fascist forces. "It would be a revolution if we could sustain the momentum and could be rightly called a post-independent renaissance". He said India could not be a country of one religion or caste as diversity had been the underlying factor since pre-historic times of the country. Challenging the RSS to prove the existence of any single ethnically homogenous society in the world, he said India's diversity was praised all over the world. Calling the BJP an 'illusion' and the RSS the 'reality', he said it was the strenuous efforts of Mahatma Gandhi that brought together all ethnic groups to fight for the freedom of the country. Earlier, Nilotpal Basu of the CPI(M) said the fight for secularism was not over with the victory in the election. "You have to continue to fight communalism, not just through elections but in all spheres of life." 3. Likewise, the news of planning of Rashtriya Swayamsewak Sangh, to take legal action against Minister Mr. Arjun Singh (Annexure P-8) and his rejoinder (Annexure P-9) were also published by 'The Hindu' as such. The same very 1st news (Annexure P-7) was also published by The Hindustan Times (Annexure P-10), The Pioneer (Annexure P-11), The Asian Age (Annexure P-12) and Navbharat Times (Annexure P-14) in their respective newspapers. The news of condemnation of the conduct of the Minister by the RSS was published (Annexure P13) by the Indian Express as well. 4. The complainant-Rashtriya Swayamsewak Sangh & Darshan Lal Jain, its Prant Sangh Chalak, respondent Nos. 1 and 2 (for brevity "the complainant- RSS"), did not initiate any action against the remaining leaders, who have also levelled similar imputations, office bearers & other newspapers, who have published the same very news in their respective Newspapers, but aggrieved by the publication of the impugned news(Annexure P-7) by 'The Hindu' newspaper, it filed a criminal complaint (Annexure P-1) against Mr. Arjun Singh, former Minister (since deceased), N.Ram, Editor-in-Chief, Publisher, P. Balachandran Printer and his firm M/s Kasturi & Sons Limited through its Managing Director, of 'The Hindu' Newspaper, for the reasons best known to it, for the commission of offences punishable under Sections 499, 500 and 501 IPC, in the Court of Chief Judicial Magistrate, Jagadhri (Haryana). 5. The complainant claimed that, although all the accused were aware of the fact that the Inquiry Commission duly appointed by the Government of India, found that there was not an iota of evidence of any kind whatsoever that the complainant- RSS, as an organization or otherwise was involved in the assassination of Mahatma Gandhi, but the statement made by Mr. Arjun Singh, printed, published and circulated by the petitioners-accused, have not only caused great mental agony and harassment to the RSS, but also to its members, followers and sympathizers as such. 6. Levelling a variety of allegations, narrating the sequence of events and listing the merits of RSS, in all, according to the complainant-RSS that the impugned statement has been intentionally made by Mr. Arjun Singh (accused) published, printed and circulated by the petitioners-accused, just to harm its (RSS) goodwill & reputation and its Members, knowing fully well that it is false. In this manner, all the accused have committed the offences in question. In the background of these allegations, the complainant filed the impugned complaint (Annexure P-1) against the main accused Mr. Arjun Singh(since deceased) and the petitioners-accused, for the pointed offences, in the manner depicted hereinabove. 7. Taking cognizance of the complaint and after considering the preliminary evidence, the Chief Judicial Magistrate, summoned the accused, to face the trial for the commission of offences punishable under Sections 499 to 501 IPC, by way of impugned summoning order dated 24.12.2004 (Annexure P-2). 8. The petitioners-accused did not feel satisfied with the initiation of the criminal prosecution against them and preferred the present petition, to quash the impugned complaint(Annexure P-1) and summoning order(Annexure P-2), invoking the provisions of Section 482 Cr.P.C. 9. The case set-up by the petitioners, in brief, insofar as relevant was that, 'The Hindu' published the news item report(Annexure P-7) on 09.08.2004 based on the material supplied/forwarded by the Press Trust of India(for short "the PTI"), a National Level Agency with high degree of credibility. Even, the news to take legal action against Mr. Arjun Singh by the complainant-RSS (Annexure P-8) and rejoinder by the Minister (Annexure P-9), were fairly published by 'The Hindu' Newspaper as well. It was claimed that 'The Hindu' has published the true news in discharge of his obligation, in order to provide the correct information to the public and no offence whatsoever is made out against them in this connection. "(i) That the complaint against the petitioner is apparently inspired by some oblique motive. The very fact that the news report in question was based on a dispatch by PTI-a news agency which is almost uniformly subscribed by all widely circulated news papers- would show that The Hindu did not have any intention to defame the complainant No. 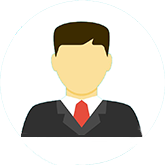 1 or persons associated therewith. An eminent national level leader as also other known public and political personalities had addressed the convention on secularism. It was the bounden duty of any widely read newspaper to give a fair and balanced report of the proceedings of the said convention. It is not even suggested that the news report Annexure P-7 is in any manner a lop sided or distorted or coloured version of the speech of Sh.Arjun Singh or the speeches made by other speakers. It can be safely presumed that the event in question would be widely covered in the national press and almost all Dailies published from Delhi for the regions surrounding the national capital, would carry reports thereof. The petitioner has placed on record copies of reports Annexures P-10 to P-14 to put things in a proper factual perspective. The complainant has not cared to mention anything in the complaint or in the preliminary evidence as to why The Hindu was chosen for discriminatory treatment. It can, therefore, be safely inferred that the petitioners have not been arraigned in the complaint in a bonafide manner; rather the exercise has been undertaken to single out one Daily. (ii) The action of the petitioners is protected under Article 19 of the Constitution of India, highlighting the importance of freedom of the Press in the democracy and is stated to be squarely covered by Exception 1 to Section 499 IPC. (iii) That in case a fair, balanced and objective report of an important public, political or social event is sought to be blacked out under the threat of prosecution for defamation, it shall not only be a body blow to the freedom of press but would also place the law of defamation as enshrined in Sections 499/500/501 of the Indian Penal Code in direct conflict with article 19(1)(a) of the Constitution of India. (v) That a comparative reading of the news item published by The Hindu Annexure P-7 and the other newspapers Annexures P-10, P-11, P-12 and P- 14 would show that the report Annexure P-7 was fair, balanced and objective. In fact the other newspapers had carried equally critical comment about RSS on 9.8.2004. It is further important to note that some of the reports in the other newspapers were covered by Special Correspondents of the concerned papers; while the report in The Hindu dated 9.8.2004(Annexure P- 7) was based on a dispatch by PTI, as submitted hereinbefore. (vi) That the choice of Jagadhri for institution of the complaint also suggests that the main objective of the complainants is to cause maximum harassment to the petitioners and their co-respondent in the complaint. The newspaper in this case was published from Delhi. The convention or the seminar where Sh. Arjun Singh delivered his speech was also held in Delhi. Some of the leading functionaries of RSS are residents of Delhi and operate from there. There is absolutely no good reason for choice of Jagadhri for lodging of complaint Annexure P-1. Of course such a cause would entail undue difficulty, inconvenience and hardship to the respondents. This circumstance also underlines the oblique objective behind institution of the complaint." 11. On the strength of aforesaid grounds, the petitioners-accused sought to quash the impugned complaint(Annexure P-1) and summoning order(Annexure P-2), in the manner described hereinabove. 12. Although, the complainant-respondent-RSS did not file any reply, to controvert the specific allegations contained in the petition, however, they have refuted the prayer of the petitioners, to quash the impugned complaint, summoning order, orally reiterated the allegations contained in the complaint and prayed for dismissal of the main petition. That is how, I am seized of the matter. 13. Taking the benefit of his usual ability and assailing the impugned complaint and summoning order, learned counsel appearing on behalf of the petitioners-accused, has contended with some amount of vehemence that 'The Hindu' is a reputed newspaper with a high degree of national credibility. It was its duty to inform the reading-public, with regard to the speech delivered by the then Human Resources Central Cabinet Minister and Senior Congress Leader Mr. Arjun Singh, in view of the mandate enshrined in Article 19(1)(a) of the Constitution of India, which guarantees the freedom of speech and expression. The argument is that since the petitioners-accused have published the indicated accurate speech in question (Annexure P-7) on the reports of PTI as such, in their newspapers, in good faith, to inform the public at large, so, it cannot be said that they intended to harm the reputation of the complainant-RSS. He has also argued that in any case, such publication would be squarely covered by Explanation 4 & Exceptions 1 & 10 of Section 499 of the IPC. The argument further proceeds that although all the other newspapers have published the same very news item(Annexures P-10 to P-14), but the complainant has filed the present complaint against the petitioners-accused only, in order to put pressure and to wreak vengeance and no offence whatsoever is made out against them. Hence, he prayed for quashment of the impugned complaint(Annexure P-1) and summoning order(Annexure P-2). 14. Hailing the impugned complaint and summoning order, on the contrary, learned counsel for the complainant-RSS, has vehemently urged, as well, that the publication of news item(Annexure P-7) by the petitioners-accused has not only caused great mental agony and harassment to the complainant, but also to the members, followers and sympathizers of RSS as such. Since, the statement was printed, published and circulated by the petitioners-accused intentionally, just to harm the reputation of RSS, so, the Trial Magistrate has rightly summoned them, for the commission of offences punishable under Sections 499, 500 and 501 IPC and no illegality could be assigned to the detailed impugned summoning order. The argument further proceeds that as the disputed questions are involved, therefore, no ground for quashing the impugned complaint and summoning order, in exercise of the power under Section 482 Cr.P.C., is made out. Thus, he prayed for dismissal of the main petition. 15. Having heard the learned counsel for the parties at quite length, having gone through the record with their valuable assistance and after bestowal of thoughts over the entire matter, to my mind, the instant petition deserves to be accepted in this context. 16. There can hardly be any dispute in respect of the crux of the propositions of law set out by the Hon'ble Apex Court in cases Smt. Chand Dhawan v. Jawahar Lal and others, 1992(3) R.C.R. (Criminal) 534 : JT 1992(3) S.C. 618; State of H.P. v. Pirthi Chand and another, 1996(2) R.C.R. (Criminal) 759 : (1996) 2 Supreme Court Cases 37; Jeffrey J. Diermeier and another v. State of West Bengal and another, 2010(3) R.C.R. (Criminal) 183 : 2010(3) Recent Apex Judgments (R.A.J.) 437 : (2010) 6 Supreme Court Cases 243, relied on behalf of the complainant-RSS that nevertheless, it is neither possible, nor desirable to lay down any inflexible guidelines/rigid formula/rule, which would govern the exercise of inherent jurisdiction of the Court. It depends upon the facts and circumstances of each case, wherein, such power should be exercised. Undoubtedly, the power possessed by the High Court under the said provision is very wide, but is not unlimited. It has to be exercised carefully. The High Court can exercise its inherent jurisdiction of quashing a criminal proceeding only when the allegations made in the complaint do not constitute an offence, or that the exercise of power is necessary either to prevent abuse of the process of Court, or otherwise to secure the ends of justice. 17. At the same time, the Hon'ble Supreme Court has categorically held in cases M/s. Pepsi Foods Limited and another v. Special Judicial Magistrate and others, 1997(4) R.C.R. (Criminal) 761 : (1998) 5 Supreme Court Cases 749; Ashok Chaturvedi v. Shitul H. Chanchani, 1998(3) R.C.R. (Criminal) 801 : 1998(7) SCC 698; Central Bureau of Investigation v. Ravi Shankar Srivastava, 2006(3) Apex Criminal 65 : (2006) 7 SCC 188 and Dhariwal Tobaco Products Limited and others v. State of Maharashtra and another, 2009(1) R.C.R. (Criminal) 677 : 2009(2) SCC 370, that whenever the High Court comes to the conclusion that allowing the criminal prosecution to continue would be an abuse of the process of Court and that the ends of justice require that the proceedings should be quashed, it would not hesitate to do so, in exercise of inherent powers irrespective of other factors. 18. Such, thus, being the legal position and material on record, now the short and significant questions, though important, that arises for determination in the instant petition are, as to whether the petitioners-accused, who were Editor, Printer and Publisher of 'The Hindu' newspaper, by publishing the accurate statement (Annexure P7), have committed any indicated offences and are liable to be prosecuted, in pursuance of the complaint(Annexure P-1) or not? 19. Having regard to the rival contentions of the learned counsel for the parties and the relevant record, to me, the answer must obviously be in the negative in this respect. 20. Ex facie, the celebrated argument of the learned counsel for the complainant-RSS that since the protection under Article 19(1)(a) of the Constitution is not available and the case of the petitioners-accused does not fall in any of the Exceptions of Section 499 IPC, so, they have committed the offences in question, is neither tenable, nor the observations of the Hon'ble Apex Court in cases M.A. Rumugam v. Kittu alias Krishnamoorthy, (2009) 1 Supreme Court Cases 101; K.M. Mathew v. K.A. Abraham and others, 2002(4) R.C.R. (Criminal) 288 : AIR 2002 Supreme Court 2989, of this Court in cases Vivek Goenka v. Col. Ram Singh(P&H), 2006(2) R.C.R. (Criminal) 700 and Vir Sanghvi v. State of Haryana, 2006(1) R.C.R. (Criminal) 115, are at all applicable to the facts of the present case. 21. As is amply clear in M.A. Rumugam's case (supra), the appellant(therein) filed a complaint before the Sub-Inspector of Police, contending that: "On 30-4-2003, the Panchayat Union Committee member and Panchayat Board President approached him and wanted land on south side of his coconut grove to lay road through the grove. He did not give consent for the proposal. In these circumstances when he visited the grove on 3-6-2003 about 9 coconut yielding trees on the south side were found slide down. When he enquired about this he came to know that Namasivayam, son of Rajagopal and Kaliappan, son of Ramu of Naluvedapathi Village were standing on the south side of my coconut grove some time back with tins in their hands. He met them and told that they were responsible for the sliding of tender coconut trees as they were seen near the trees by some people of the village. They confessed that they on the advice of Kittu alias Krishnamurthy, son of Vedaiya Gounder of Naluvedapathi Village along with him poured acid mixed kerosene into the coconut trees and they have done it since he did not give consent to lay road through his coconut grove". In the said complaint, the appellant requested the Sub-Inspector of Police to take action against those persons and sought protection for himself and his property. On the basis of complaint, a criminal case was registered against the respondent. The police authorities neither filed any charge-sheet within six months, nor sought for the extension of time for the purpose of conducting further investigation. The Magistrate ordered the stopping of further investigation and consequently closed the matter. The allegations levelled by the appellant were stoutly denied by the respondent. Thereafter, the respondent filed a criminal complaint, for commission of the offence of defamation against the appellant(therein). 22. Similarly, in Vir Sanghvi's case (supra), the President of the Haryana Vikas Party, accused former General Secretary of the Party of defrauding the HVP of Rs. 10 crore, subsequently, who had joined the National Congress Party(NCP) of Mr. Sharad Pawar. The allegations were also denied by complainant Ved Pal(therein). So, on the peculiar facts and in the special circumstances of that case, it was observed by this Court that it required to prove by evidence whether the imputation made by the accused (therein) was in good faith or for the protection of his or others' interest, which cannot be decided in a petition under Section 482 Cr.P.C. 23. Sequelly, in K.M.Mathew(Supreme Court) and Vivek Goenka's cases(supra)(P&H High Court), the question before the Courts was whether, the Managing Editor, Resident Editor or Chief Editor of a newspaper are immune from prosecution for libellous matter published in the newspaper, in view of Section 7 of The Press & Registration of Books Act, 1867 or not? After considering the provisions of Section 7 of the said Act, it was observed that presumption contained in Section 7 of the Act, is rebuttable and it does not mean that there is a statutory immunity against the Managing Editor, Resident Editor or Chief Editor, against any prosecution for the alleged publication of any matter in the newspaper over which, these persons exercise control although, a similar presumption cannot be drawn against them. It was also observed that nevertheless, the complainant can still allege and prove that they had the knowledge and they were responsible for the publication of defamatory news item. Even, the presumption under Section 7 is a rebuttable presumption and the same could be proved otherwise. That by itself indicates that somebody other than the Editor can be held responsible for selecting the matter for publication in the newspaper. 24. Possibly, no one can dispute in regard to the aforesaid observations, but to me, the same would not come to the rescue of the complainant-RSS in the present controversy, for the reasons mentioned hereinbelow. It is with a view to checking such malpractices which interfere with free flow of information, democratic constitutions all over the world have made provisions guaranteeing the freedom of speech and expression laying down the limits of interference with it. It is, therefore, the primary duty of all the national Courts to uphold the said freedom and invalidate all laws or administrative actions which interfere with it contrary to the constitutional mandate. Freedom of expression has four broad social purposes to serve : (i) it helps an individual to attain self fulfilment, (ii) it assists in the discovery of truth, (iii) it strengthens the capacity of an individual in participating in decision-making and (iv) it provides a mechanism by which it would be possible to establish a reasonable balance between stability and social change. All members of society should be able to form their own beliefs and communicate them freely to others. In sum, the fundamental principle involved here is the people's right to know. Freedom of speech and expression should, therefore receive a generous support from all those who believe in the participation of people in the administration. It is on account of this special interest which society has in the freedom of speech and expression that the approach of the Government should be more cautious while levying taxes on the matters concerning newspaper industry than while levying taxes on other matters." 26. Again, the Hon'ble Apex Court reiterated the same principle of freedom of speech & expression in case Secretary, Ministry of Information and Broadcasting, Govt. of India and others v. Cricket Association of Bengal and others, AIR 1995 Supreme Court 1236 and has observed that "the freedom of speech and expression includes right to acquire information and disseminate it. Freedom of speech and expression is necessary, for self expression which is an important means of free conscience and self fulfilment. It enables people to contribute to debates of social and moral issues. It is the best way to find a truest model of anything, since it is only through it, that the widest possible range of ideas can circulate. It is the only vehicle of political discourse so essential to democracy. Equally important is the role it plays in facilitating artistic and scholarly endeavours of all sorts. The right to communicate, therefore, includes right to communicate through any media that is available whether print or electronic or audio-visual such as advertisement, movie, article, speech etc. that is why freedom of speech and expression includes freedom of the press. The freedom of the press in terms includes right to circulate and also to determine the volume of such circulation. This freedom includes the freedom to communicate or circulate one's opinion without interference to as large a population in the country as well as abroad as is possible to reach. The fundamental right can be limited only by reasonable restrictions under a law made for the purposes mentioned in Art.19(2) of the Constitution." In the same sequence, the enactments of The Freedom of Information Act, 2002 and The Right to Information Act, 2005, are the other steps in this relevant direction. 27. As is evident from the record that the complainant has filed the complaint(Annexure P-1) against the petitioners-accused, inter alia, on the ground that they have printed, published and circulated the statement(Annexure P-7) delivered by their co-accused and former Central Cabinet Minister and Senior Congress Leader Mr. Arjun Singh(since deceased), intentionally, just to harm the goodwill, reputation of RSS and its followers, knowing fully well it to be false. In this way, they were stated to have committed the offences punishable under Sections 499 to 501 IPC. 28. As is apparent that, Section 499 IPC postulates that "whoever, by words either spoken or intended to be read, or by signs or by visible representations, makes or publishes any imputation concerning any person intending to harm, or knowing or having reason to believe that such imputation will harm, the reputation of such person, is said, except in the cases hereinafter expected, to defame that person." The words "knowing or having reason to believe" intending to harm the reputation, are very important and carry significant meaning in this regard. 29. Not only that, Explanation 4 further posits that "no imputation is said to have harm a person's reputation, unless that imputation directly or indirectly, in the estimation of others, lowers the moral or intellectual character of that person, or lowers the character of that person in respect of his caste or his calling, or lowers the credit of that person, or causes it to be believed that the body of that person is in a loathsome state, or in a state generally considered as disgraceful." In this manner, Explanation 4 to Sec. 499, IPC places a curb on the general description of definition contained in the section. It makes only such imputations punishable as might lower a person's reputation in respect of some aspects of his personality and makes an imputation defamatory only if it lowers a person in the estimation of others. It implies a fall in reputation. The reputation has been used to denote the estimation in which a person is held by others, the character imputed to him in the community or the society to which he belongs. 30. Likewise, there are certain statutory Exceptions 1 to 10 attached to this section. First Exception escalates that it is not defamation to impute anything which is true concerning any person, if it be for the public good that the imputation should be made or published. Whereas, Tenth Exception provides that, it is not defamation to convey a caution, in good faith, to one person against another, provided that such caution be intended for the good of the person to whom it is conveyed, or of some person in whom that person is interested, or for the public good. According to Section 501 IPC that whoever prints or engraves any matter, knowing or having good reason to believe that such matter is defamatory of any person, he is liable to be punished under this Section. 31. A conjoint and meaningful reading of these provisions would reveal that, in order to entail the penal provisions of Sections 499 and 501 IPC, it was incumbent/obligatory on the part of the complainant-RSS to prima facie, prove that the accused have intentionally published the accurate news with the intention to harm or with the knowledge or having good reasons to believe that it would harm its reputation. The essence of the offence of defamation must have been made either with the intention of causing harm, or knowing or having reason to believe that such imputation would cause harm to a person. 32. As depicted hereinabove, in the instant case, the complainant-RSS has miserably failed to indicate as to how, when and in what manner, the mere accurate publication, of the statement of the main accused Central Cabinet Minister and Congress Leader Mr. Arjun Singh, by the petitioners-accused was intentional or they have the knowledge or belief that it will harm its reputation. Even it is not claimed by the complainant either in the complaint or preliminary evidence that publication of news (Annexure P7) is in any manner distorted or coloured version of the speech of the Minister. It is not a matter of dispute that the petitioners-accused have published the accurate statement of the Minister on the reports of PTI as such. That means, the requisite intention/knowledge, (Mens-rea) to defame the complainant RSS or the person associated with it and all other essential ingredients are totally lacking in this case. Meaning thereby, such fair, accurate and truthful reporting by the petitioners in the absence of mens rea would not constitute any offence. This matter is no more resintegra and is now well settled. 33. An identical question came to be decided by the Hon'ble Supreme Court in case Jawahar Lal Darda and others v. Manohar Rao Ganpat Rao Kapsikar and another, 1998(2) R.C.R. (Criminal) 455 : (1998) 4 Supreme Court Cases 112, wherein while interpreting the relevant provisions of Sections 499 to 502 IPC, it was ruled that accurate and true reporting/publication in good faith, cannot be said that the accused intended to harm the reputation of the complainant and no offences under Sections 499 to 502 IPC, are made out against the accused. "History and its historical figures, who once strode this earth and stood as colossus on it have always been an enigma for the subsequent generations. The heroes and villains of history, their personalities, passions, actions, omissions, compulsions for such acts and omissions, which made them stand out, have always been the subject-matter of intelligent speculations among the academicians, historians and theorists, who paint them in various colours including the grays and blacks and give their characters a real and a fictional touch. Nathuram Godse was no different and accordingly, he has been the subject-matter of intense studies which tried to unravel his past and also tried to understand the motives of actions and killing of the Father of the Nation. In the midst of such speculations based on historical and archival records, he and his association with the R.S.S. have been commented upon variously. Reverting back to the article, it nowhere delineates the role of the R.S.S. and does not attribute any overt, covert or conspiratorial role to it while describing the act of Nathuram Godse. In the absence of any such allegations and consequent evidence led by the complainant before issuance of summoning order, it cannot be termed to be derogatory and defamatory to the R.S.S. Besides, an article has to be read in its entirety and an isolated passage cannot be read out of context. The Court is cast with a duty to decide what impression the article would produce on the mind of an unprejudiced reader and the offending article, if read in this context, also refers to the present legatees of Mahatma Gandhi, which probably includes all and sundry of the society and the political class of today, who have carried on with the sectarian and factional tendencies- a telling and a cynical comment on the prevailing situation by the author. Such an article can hardly be termed to be scandalous unless a hypocritical society wants to turn a Nelson's eye to the realities." Accordingly, it was ruled that no offences under Sections 499 and 501 IPC, are made out in that regard. 35. Meaning thereby, all the essential ingredients of the offences are not complete. As indicated earlier, the petitioners-accused have published the speech of Central Cabinet Minister and Senior Congress Leader Mr. Arjun Singh, Annexure P-7 in their newspaper correctly on the material and reference made by PTI, in good faith and just to inform the public. If the contention of learned counsel for complainant-RSS is accepted that such truthful and accurate reporting is an offence, then, there will be no end of anything and it will amount to nullifying the constitutional mandate, Explanation 4 and Exceptions to Section 499 IPC, which, to me, is not legally permissible. 36. There is yet another aspect of the matter, which can be viewed from entirely a different angle. Although the Central Cabinet Minister Mr. Arjun Singh delivered the speech, but other leaders A.B. Bardhan and S. Jaipal Reddy have made their speeches at the relevant time, which were also published, vide publication (Annexure P-7) by The Hindu Newspaper. Again it is not a matter of dispute that the same very news was also published in The Hindustan Times (Annexure P-10), The Pioneer (Annexure P-11), The Asian Age (Annexure P-12) and Navbharat Times (Annexure P-14) in their respective newspapers. In order to show their bona fide and independence, not only that, the petitioners- accused have published the news of planning of RSS, to take legal action against the Minister (Annexure P-8), they have also published the rejoinder (Annexure P-9) issued by the Minister in their newspaper 'The Hindu'. The news of condemnation of the conduct of the Minister by the RSS was published (Annexure P-13) by the Indian Express as well. 37. Strange enough, the complainant neither implead the other speakers, who levelled the similar imputation against RSS nor filed any criminal complaint against the Editor, Printer and Publisher of other newspapers, who have also published the same statement in their respective newspapers, in the manner stated hereinabove. 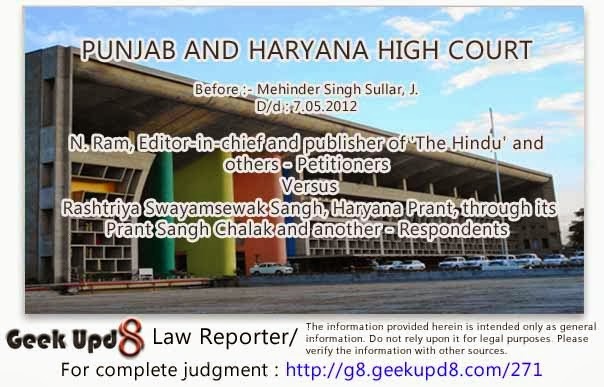 Moreover, the mere fact, that the news item (Annexure P-7) was published by "The Hindu" paper from Delhi and the complainant-RSS has filed the present complaint at Jagadhri (Haryana), is indicative of the fact and corroborates the case of petitioners-accused that the complainant has filed a false complaint in order to harass them. 38. Thus, seen from any angle, if the legal provisions, material, totality of other peculiar facts and the special circumstances of the case, oozing out of the record, as discussed hereinbefore, are put together and analyzed in right perspective, then, to my mind, the conclusion is inescapable and irresistible that the protection under Article 19(1)(a) of the Constitution of India is available and since the accurate publication by the petitioners-accused squarely falls within the domain/ambit of Explanation 4 and pointed Exceptions of Section 499 IPC, so, to me, no offence whatsoever is made out and the complainant-RSS has only filed the complaint (Annexure P-1) against them with a mala fide intention, vexatiously and in order to wreak vengeance. The petitioners-accused cannot possibly be allowed to suffer a prolonged criminal trial, as per the law laid down by the Hon'ble Apex Court in M/s Pepsi Foods Limited's case (supra). In that eventuality, such false criminal prosecution against the petitioners-accused amounts to clear & deep misuse/abuse of process of the Court and deserves to be quashed, in view of the law laid down by the Hon'ble Supreme Court in a celebrated judgment in State of Haryana and others v. Ch. Bhajan Lal and others, 1991(1) R.C.R. (Criminal) 383 : AIR 1992 Supreme Court 604, which was again reiterated in case Som Mittal v. Government of Karnataka, 2008(2) R.C.R. (Criminal) 92. Moreover, in case, if such false prosecution is allowed to continue and the petitioners-accused were compelled to suffer a prolonged criminal litigation at Jagadhri (Haryana), then it will inculcate and perpetuate injustice to their case, which is not legally permissible. 39. Therefore, the indicated contentions of learned counsel for petitioners- accused have considerable force and the contrary arguments of the learned counsel for the complainant-RSS pale into insignificance, "stricto sensu" deserve to be and are hereby repelled under the present set of circumstances as the ratio of the law laid down in the aforesaid judgments "mutatis mutandis" is applicable to the facts of the present case and is the complete answer to the problem in hand. 40. No other legal point, worth consideration, has either been urged or pressed by the learned counsel for the parties. 41. In the light of aforesaid reasons, the instant petition is accepted. Consequently, the impugned complaint (Annexure P-1), summoning order (Annexure P-2) and all other subsequent proceedings arising therefrom, are hereby quashed. The petitioners-accused are accordingly discharged from the indicated criminal complaint in the obtaining circumstances of the case.